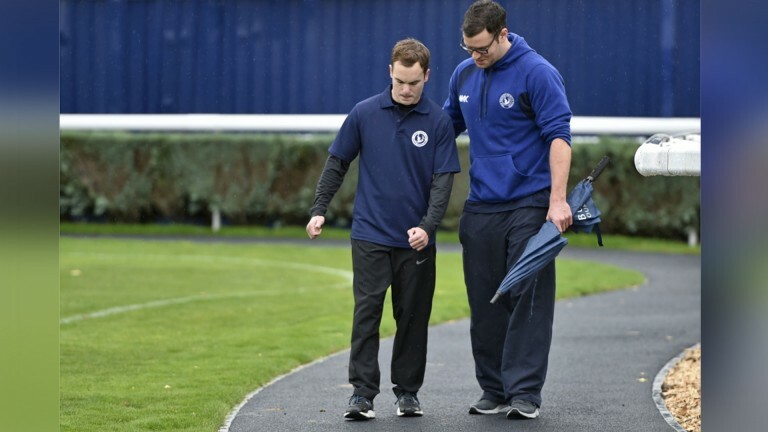 Three years ago, Ed Barrett was told he would not walk again, but on Saturday he showed just how wrong that was by completing a lap of Newbury's parade ring. There was rapturous applause as the former point-to-point rider, who was injured in a fall, reached the finish after 20 minutes. "It was very difficult," said the 30-year-old from Bromyard in Herefordshire, who was raising money for the Injured Jockeys Fund and the Nicholls Spinal Injury Foundation. "I got to halfway and thought I wouldn't get round. But I just kept going one step at a time. I had someone in mind when I was walking around, so I was doing it for them. I just kept looking at my feet and concentrating – I’m glad I’ve done it." Barrett was paralysed when his horse fell and kicked him in the neck at Upcott Cross in April 2015. He had an operation to rebuild his neck and spent six months in hospital. He said: "I couldn’t move from the neck down. I didn’t think I would be able to stand up, let alone walk. But slowly some feeling came back and I’ve kept working hard in the gym." Barrett spent four months at the Injured Jockeys Rehabilitation and Fitness Centre and Oaksey House and can now walk short distances with the aid of crutches, which he dispensed with on Saturday. His father, David, said: "The prognosis wasn't very good, but he’s a boy with his own thinking and determination – the IJF have been brilliant." Considering his next challenge, Ed Barrett said: "I don’t think I liked the ground today. I prefer good to firm and nice conditions!" You can support Barrett's efforts here.